7641 City Corner is a City Traffic set released in May 2009. It contains a bus stop, a pizza shop with oven and seats inside, and five minifigures. It also contains a bus with driver, and a bicycle shop with accessories. The set was also included in 2853301 City Transport Collection. Both buildings and the bus stop have their own baseplate, allowing to rearrange the street scene. The house that contains the pizza shop has three levels, including the attic. The ground floor contains a counter and a pizza oven that features a lever mechanism that allows to open its transparent front door. As in 6350 Pizza To Go, an oar piece serves as pizza shovel. On the first floor is a dining area with two tables and four seats. Per default, each table has a transparent goblet on it. The top floor under the attic is empty and is too low-ceilinged for minifigures. The first floor and the attic can be detached individually to gain easier access to the respective lower level. The bicycle shop has a skateboard, a helmet and a baseball cap on this display behind the window. Inside is also a toolrack with a hammer and wrench. In front of the shop is a street lamp and on its roof is a surveillance camera. The bus stop consists of a small shelter with a bench inside and sign in front of it. Next to it is a trashcan, a hydrant, a flower in a pot and a streetlamp that is identical to the one at the bike shop. The bus contains five seats for passengers besides the one for the driver and has two doors. The interior can be accessed by detaching either of two roof plates. On the outside are advertisement for the bike shop and the pizzeria, as well as for the cargo company and Octan. The five minifigures comprise the female chef of the pizza shop, the bicycle shop attendant, a busdriver and a pedestrian, as well as a skateboarding kid (short legs) with helmet. A red bicycle and blue skateboard with stickers are also included with the set. This is the first set since 379 Bus Station from 1979, that contains a transit bus. And the first pizza shop since 6350 Pizza To Go from 1994. Although the later set was rereleased in 2002. The logo on the bus stop is the same as the one of the railway company from the Trains line. This set was included in the Product Collections set 2853301 City Transport Collection. 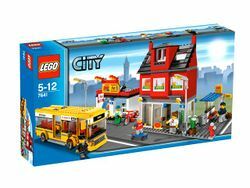 The buildings of this set can be rearranged with the 8403 Family House, 7633 Construction Site, 7848 Toys R Us Truck, and 3661 Bank and Money Transfer buildings to create a street scene similar in design and concept like the Modular Houses line. The lever mechanism is combined with both LEGO Technic and LEGO System bricks. The Skateboarder is also thought to be a young Pepper Roni, making it his first appearance in LEGO merchandise for 4 years, and still his latest appearance to date. The set appears in the background of Minifigures All Around Town! in LEGO Club Magazine Issue 1 2011. The set is being re-released as set 60031 in 2013. This is a description taken from LEGO.com. Please do not modify it. (visit this item's product page) LEGO City grows and grows! Build a corner scene from LEGO City! Will the businessman be late for the bus? Will the boy get the skateboard of his dreams? And who gets to enjoy the freshly-bake pizza? It's all up to you! Build a pizzeria, bike/skate shop, and bus with bus stop. Includes 5 minifigures (bus driver, pizza girl, skater boy, mechanic and businessman) and accessories! Lots of play opportunity: includes pizzeria, bike & skate shop, bus and bus stop! Highly detailed! Working doors and windows, seat the minifigures on the bus or have them dine at the pizzeria! Don't forget to pick up the bike at the repair shop! Bus measures over 7 inches (17.8cm) long by 3 inches (7.6cm) tall! Two story Pizzeria measures 5 inches (12.7cm) long by 7 inches (17.8cm) tall! Bike/skate shop measures 5 inches (12.7cm) long by 3 inches (7.6cm) tall! Bus stop measures 5 inches (12.7cm) long by 2.5 inches (6.4cm) wide! Facts about "7641 City Corner"
LEGO City grows and grows!